Welcome to the 2016 South Sound Direct Sales Farm Map! Use the map below to find a farm or farmers' market near you! 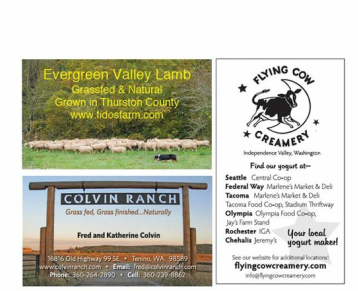 Scroll down for a complete listing of farmers who sell direct to consumers. Emu oil is the best thing that you can do for your skin: transdermal, soothing and moisturizing. Red meat is 3-4% fat and tasty. Soap, beauty products, eggs, and more available. Emus are fun to raise. Summer tours welcome. Garlic, organically grown. Ten varieties. Scapes, green garlic, or cured in bulk and braids. We also feature farm made artisan fruit wines and tastings, seasonal produce, hand-thrown pottery, antiques, and gifts. We are located between Capitol Forest and the Black River on scenic Gate Rd. just south of Littlerock and north of Rochester. Premium organic grass-fed, grass-finished beef. Delicious, dry-aged, lean and tender. Pre-SOLD OUT for 2016. Sustainably pastured, humanely harvested at home, for low stress and high quality. Professionally harvested in June. Professionally cut and wrapped. $5/lb hanging wt. + butcher’s fee. Please email or text for appointment and address. Best Family Farms strives to be at the forefront of sustainable agriculture by adopting the latest technology to provide both retail and wholesale high quality, competitively priced, fresh produce. We also strive to increase community and individual awareness and understanding of modern food sustainability and the benefits of healthy year-round clean eating. All natural grass fed Angus beef, all natural pork, weaner pigs, BBQ/Luau pigs. Born and raised on our fourth generation family farm. Building Earth Farm creates community through food, festivals, and fun. We offer a summer/fall CSA with gorgeous vegetables and Washington-grown fruit. We also offer a winter box subscription that includes local foods and sunny citrus to nourish our community year-round. Our focus is breed conservation of the Barbados Blackbelly sheep, which has less than 2,000 known animals in the U.S. Barbados Blackbelly are known for their gourmet quality meat. Occasionally we have a lamb available or customers can reserve a lamb in advance. All of our sheep are raised naturally, on available forages and hay, and rotated to fresh pastures regularly. We grow a wide variety of certified organic produce. We emphasis quality and diversity. Join our CSA, find us year round at the Olympia Farmer's Market, or find our produce at the Olympia Food Co-op and at various area restaurants. We are a small family farm and are increasing our fresh produce. We will continue our jams, jellies, and syrups. U-cut Christmas Trees (Noble, Fraser, Grand & Douglas Fir) & wreaths. Ride a trolley pulled by our team of Draft Horses. Gift shop with local crafts and ornaments. Free services: music, Santa on Sundays, candy canes, coffee/hot cider, cutting assistance, trees baled, tree shaker. Nov 25 - Dec 18, Fri - Sun 9 am - 5 pm. 100% grass fed and finished, all natural, beef available by the side (half or quarter), Beef by the Box- 20-25 lbs of variety of cuts and individual packages. Pork by the half or whole, available May - Oct.
We are a long-established CSA farm located on the western edge of Olympia. Harvested the morning of delivery, small and large shares available mid-May through October. Early spring shares also available. Sliding scale prices and SNAP accepted. Cozy Valley Farm, dba as Cozy Vale Creamery, is a RAW milk dairy. We milk a small herd of Jersey, Milking Shorthorn, and Brown Swiss cows. We are mostly organic. Our farm is open on Saturdays for milk, eggs, cheese, beef and lamb. Approx 2.5 miles down Churchill Rd. Mailbox with address on left, driveway is to the right. No signs. Driveway goes down over low fields but continue on until shop on left, look for white refrigerator outside of shop. We sell Angus beef by hanging weight: half, quarter, whole. Beef naturally raised on pasture hay, dry hay, and finished on grain. No hormones. Ready late spring. Orders taken in advance. Shelton-Matlock Rd. to Matlock, continue to Deckerville Rd. West on Deckerville about 3 miles. Historic farm north of Olympia. Founded by George & Clella Esterly circa 1930. We have farmed organically for over 20 years. Home base to Ladyberry Produce offering CSA shares. Indoor/outdoor storage available for farm equipment and household items. See Facebook "The Esterly Farm" for information and events. Grass fed and natural lamb, grown at Fido's Farm, is tasty, tender and lean. Enjoy this succulent lamb and, at the same time, support the economic viability of small farm agriculture and open space in Thurston County. Come visit! Over 600 English Lavenders, in 11 varieties, provide an array of colors, shapes and scents. Our Gift Shoppe offers lavender-based products/gifts and pure essential oils created here. Think of us for Team-Building, Yoga, Gatherings and more. Open: Mid-June through Mid-August, Thurs-Sundays 10-4. Take Yelm Hwy to Meridian Rd and head South (past the EVG store). Follow signs to the Farm. Entrance is off Valley Green Rd. Furrow Horse Farm is a small, diversified, horse-powered farm in the foothills of the Cascades near Morton. With the help of our Belgian mares, Lady and Abby, we grow approximately 2 acres of vegetables and cut flowers. This year we are planning a 30 member CSA, and attending two farmers markets, most likely Olympia and Chehalis. We grow and sell organic seeds, plant starts and hawthorn berries. We offer seasoned hawthorn wooden raw-materials for making buttons, knitting needles and kitchen tools. We also give free consultation on home gardening at your home. Fresh veggies, fruits, and flowers grown with school youth programs. Available at the West Olympia Farmers Market, at our Neighborhood Market Stand (July- Oct, Wednesdays 4-7), and through our CSA. Accepting cash, check, credit and EBT for all food sales. Enjoy the bounty of our sustainable farm and the hardworking young people who make GRuB rock! 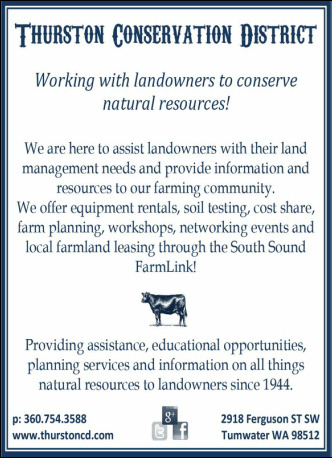 Farm field trips and volunteer opportunities. North on Division (from Black Lake Blvd. or Harrison Ave.) Right at Elliott Avenue. Please call for appointment. Come find oysters at the source! Hama Hama is a fifth generation family-run shellfish farm on the Olympic Peninsula. We welcome visitors to our year-round farm store and oyster saloon, and hold special u-pick events in the springtime. 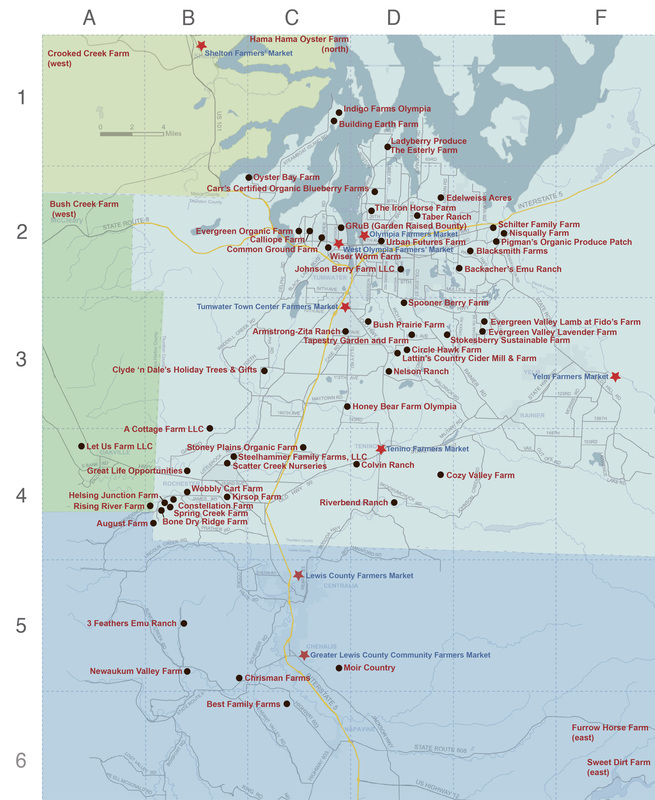 We're located on Highway 101 about an hour north of Olympia and an hour south of Port Townsend. Phone call or email for appointment and driving directions. We have flowers, honey, eggs, vegetables, raspberries and seasonal fruit. Find our products at Spud’s, the Darigold Feed Store, and George and Sons Market. A demonstration farm for experiential learning in ecological design and sustainable agriculture. We are the home of fruits and nuts! We are planting a significant blueberry patch with assorted berries, bees, and flowers. See our website for farm stand/store hours. Sweet Dirt Farm is a small diverse farm in eastern Lewis County where the sun does shine. Our vegetables and strawberries are grown with respect for the planet and our community. Fresh produce and warm smiles are available at the Packwood Saturday market, located at 105 Main Street East, June through September from 9am-1pm. Taber Ranch raises registered Black Angus cattle, registered Barbados Blackbelly sheep, registered white German Shepherds, emus, Chinese geese, Cayuga ducks, and we tend bees for honey. We also grow daffodils, tulips, lavender, blueberries, grapes, Tayberries and various tree fruits. Plant Geeks and Foodies unite! We are a family-owned farm and specialty nursery in East Olympia. Our farm-stand offers our own sustainably grown produce and eggs, honey, garden art and elements. Plant offerings… choice Japanese Maples, perennials, flowering shrubs, conifers and edibles. I-5 Northbound, exit 104. I-5 Southbound, exit 103. Custer Way, Right on Cleveland Ave, becomes Yelm Hwy). Right on Rich Rd. Left on Normandy. 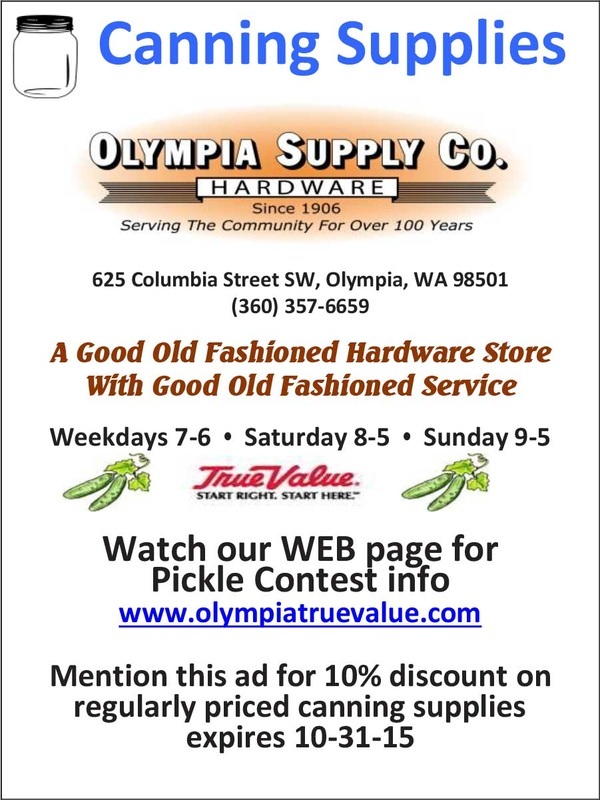 Vegetables, fruits, flowers and starts within walking distance of Olympia’s NE neighborhoods. We’re pleased to offer the tastiest, most nutritious produce possible for your table. Check out our website and blog to find out what’s fresh each week, with tips on how to prepare the bounty of the season – follow us as we grow! Seven blocks north of Ralph’s Thriftway – please visit our website for directions. On Stokesberry Sustainable Farm, we raise healthy meat and eggs. Our poultry (chicken, ducks, and turkeys) are certified organic. We feed only certified organic feed. Our pork and poultry live on the land, not just in houses, and are treated with RESPECT. Providing certified organic vegetables, flowers, pastured poultry and more through CSA and local farmers markets. We sell vegetables, flowers, and herbs using sustainable practices without the use of pesticides or synthetic fertilizers. Stop by anytime to visit our farm store from June through December. MMoir Country specializes in grass fed beef, goats, and pasture raised chicken, turkey and pork. We feed locally grown, soy-free, corn-free, no GMO feed. We are at Chehalis, Tumwater, Centralia and Tenino Farmers Markets. See website for complete listing. Products also available for pickup at the farm. Turkeys are available fresh for Thanksgiving and Christmas. Call or e-mail to order. Our family-run farm has been providing meat to our community for 155 years. All of our cattle are born on the farm and are free of antibiotics and growth hormones. We sell beef by the quarter or individual cuts by the pound. We produce a wide variety of certified organic vegetables in the Chehalis river valley. Bike to our farm stand on the Willapa Hills trail. Attend one of our seasonal farm to table dinners featuring local producers and talented chefs. Grass-fed lamb, beef, pork, and poultry; eggs, flowers, apples, plums and pears. Available seasonally by advance order and/or CSA membership. Email for more information and product availability. Call for appointment and driving directions. Large variety of vegetables and berries. Asparagus, green beans, cucumbers, corn and kraut cabbage are a few of our crops. Bulk orders welcome. U-Pick strawberries and raspberries throughout season. 22 week CSA. Pumpkin Patch open throughout October, school field trips encouraged. 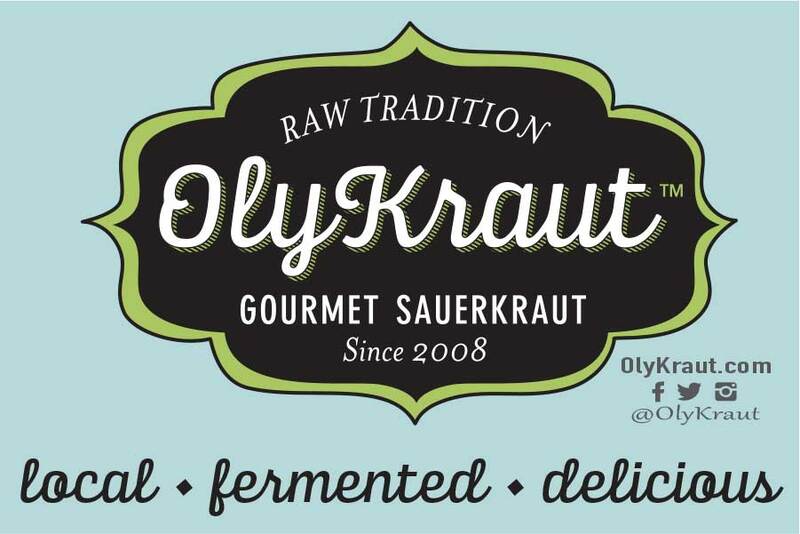 We are at the Olympia Farmers Market (Space 24) April 9- July 1. We also have greenhouses in Rochester. 35 years of growing plant starts: annuals, strawberry plants, kitchen herbs, vegetable starts, and hanging baskets. Petting zoo on weekends during May and available for special occasions. Hours: Tues-Sun, 10-5pm, April 21rd-July 1. Driving directions: I-5 exit 88, W onto Hwy 12. R at 1st light, L on 196th to Sargent Rd, R, 4 mi to 173rd St. At 173rd turn L. Go 1/2 mile, turn R at sign. Farm stand open May-September with spring flowers. Berries throughout the summer along with our fresh vegetables and fruits. September 24-Octctober 31 open for Pumpkin Patch and Harvest Festival. Corn maze, hayrides, cannons, farm animals, tasty fall concessions. November 25-December 20 open for Choose and Cut Christmas trees. Santa visits. Netting, flocking, wreaths, garland available. 250 different culinary, medicinal herbs and veggie starts. Blueberry & strawberry plants available. Fresh cut and dried lavender, lavender sachets, and bulk dried lavender. All grown without chemical fertilizers, herbicides, pesticides or fungicides. In business for 29 years. Plants available at Olympia Food Coop and Olympia Farmers Market Feb – Aug.
We have been selling at farmers markets and wholesale for about 39 years. We have a CSA program at most of the markets that we sell at. We have a full CSA and a partial. Our CSA starts in the middle of May. If you would like a brochure please call or email us. We are a small certified organic farm located on the banks of the Chehalis River. We offer an outstanding variety of vegetables, herbs and berries through Summer and Fall CSA programs. We also sell at both the Olympia and Chehalis Farmers Markets. You can order bulk quantities of pickling cucumbers and more for canning and preserving. The market is moving to a new location in downtown Centralia this year. Use the Harrison St. exit from I-5. Signs will be posted so you won't be able to miss us! The market has run continuously for 31 years. Our market includes farm fresh local produce, fresh fruit and veggies from the Yakima Valley, veggie and landscape plants, fresh bakery products, local meat, crafters and artisans. The Olympia Farmers’ Market offers our community the freshest selection of regional farms products and finest artisanal crafts. Come join this vibrant South Puget Sound event and experience live music, great cuisine, and community gathering. Now open year round! Jan-March, Saturdays Only, 10am - 3pm. April - October, Thursday- Sunday, 10am - 3pm. November - December, Saturday - Sunday, 10am - 3pm. Located at the North End of Capitol Way. Come friends and enjoy organically grown local produce, handcrafted goods, fresh baked goods and many other goods from vendors within our community. Get your fresh produce, gifts, many of your household needs, plants for the garden, jewelry, fresh seafood, baked goods and much more. Saturdays from 9am - 2pm. Located in downtown Shelton on 3rd & Franklin, behind the Post Office, one block off Railroad. Market runs from May through September. Location: 213 Sussex Avenue W.
Welcome friends to our 12th season. Located in the historical district of downtown Tenino on Olympia Street. Special events throughout the season. Visit our website and Facebook for additional information. We accept WIC and Senior FMNP Coupons. 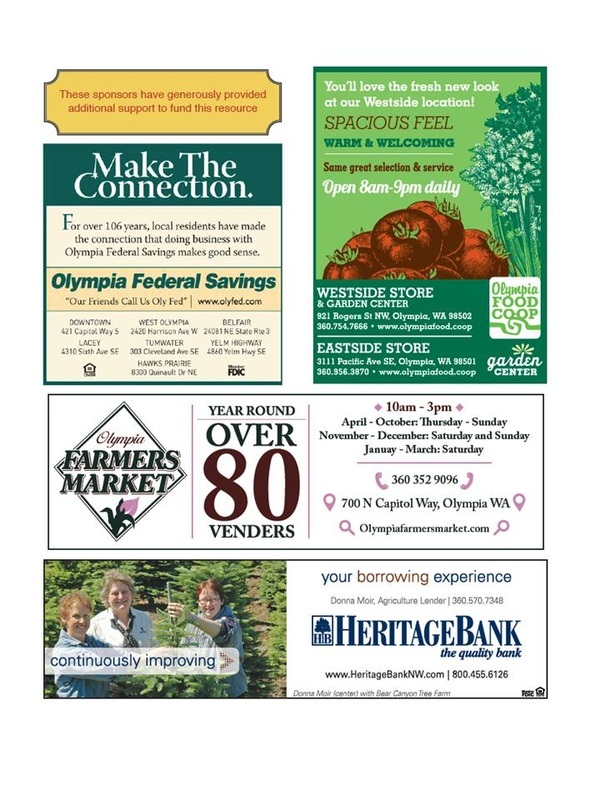 Celebrate our 10th anniversary with a visit to the Tumwater Farmers Market. Local farmers, processors, crafters/artisans and prepared food vendors all next to a neighborhood park. Live music at every market. Special events throughout the season. Easy and convenient parking behind the Market, access from Capitol Blvd or Tumwater Blvd. Follow signs from Capitol Blvd just south of Israel Rd and take a right at the WSECU Credit Union. Directions from I-5: Take the Tumwater Blvd exit towards the airport and turn left on Cleanwater Lane (just before Capitol Blvd). Parking at the end of that street behind WSECU. Support small and beginning farmers and artisans at this weekly neighborhood market! Shop for produce, flowers, pastured meats, herbs, plant starts, eggs, crafts, baked goods, and much more! Open Tuesdays, from 4pm - 7pm, from May 10th through October 11th 2016. Our location is the West Side Park at the corner of Harrison and Division. Yelm Farmers Market is situated just outside the City of Yelm on a beautiful organic farm beside the Nisqually River. Live music, delicious local produce, farm products, plants, gifts and much more make this a fabulous destination for a Sunday outing. We also run an awesome kids' program so come & check us out! Accepting Debit Cards, SNAP EBT, WIC and Senior FMNP.